The Classroom Challenges materials may be copied and distributed, unmodified, under the Creative Commons Attribution, Non-commercial, No Derivatives License 3.0. All other rights reserved. Please send any enquiries about commercial use or derived works to map.info@mathshell.org. Are these suitable for my students? We have assigned lessons to grades based on the Common Core State Standards for Mathematical Content. During this transition period, you should use your judgement as to where they fit in your current course. 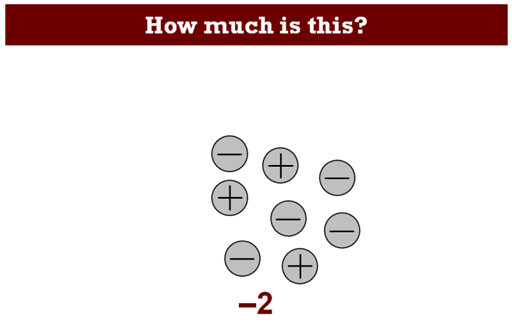 Add and subtract directed numbers (positive, negative and zero) with understanding. Address common misconceptions about the addition and subtraction of directed numbers. Explain their reasoning using diagrams. Before the lesson, students work individually on an assessment task designed to reveal their current understanding. You then review their responses and create questions for students to consider when improving their work. After a whole-class discussion that introduces the charge model for directed numbers, students work in small groups on two collaborative discussion tasks in which they match diagrams with calculations and produce missing diagrams for the remaining calculations. In a whole-class discussion, students discuss what they have learned. Finally, students revisit their initial work on the assessment task and work alone on a similar task to the introductory task. Each student will need a mini-whiteboard, pen and eraser, some blank paper and copies of the assessment tasks Directed Numbers and Directed Numbers (revisited). Some small plastic counters of two contrasting colors might be useful if readily available. Glue would be useful but is not essential. Each small group of students will need a copy of the two sheets Calculations (1) and Calculations (2) and cut-up copies of both Card Sets. The Calculations sheets and the Card Sets should all be enlarged (by the same amount), if possible, to make the cards easier to handle. 15 minutes before the lesson, a 90-minute lesson (or two 50-minute lessons), and 15 minutes in a follow-up lesson. Exact timings will depend on the needs of your students. 6.NS: Apply and extend previous understandings of numbers to the system of rational numbers.